Eastbourne in East Sussex sits on the south coast bordering the South Downs National Park. It’s the perfect place for getting outdoors and breathing in all that fresh sea air. I visited for a mid-week mini-break and given that the town’s labeled the UK’s sunniest it seemed only right that I should explore its outside activities. And there’s a lot of things to do in Eastbourne. 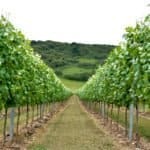 Here are my top picks for what to do in Eastbourne and its surrounding countryside. After checking in at the View Hotel Eastbourne, which, as the name suggests, has great coastal views in both directions, my friend Kathryn and I headed east along the seafront. A stroll along Eastbourne beach is an essential part of a visit to the town especially if ice-cream’s involved. 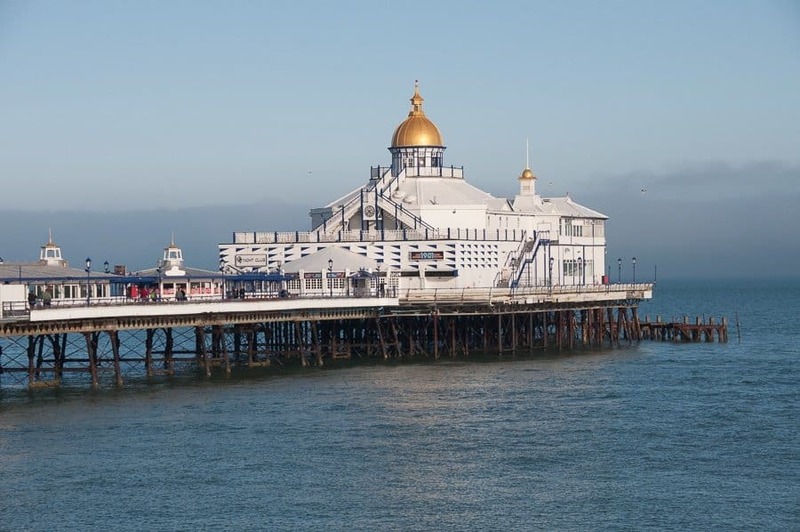 We passed Britain’s busiest Bandstand, an iconic venue and one of the top tourist attractions in Eastbourne. 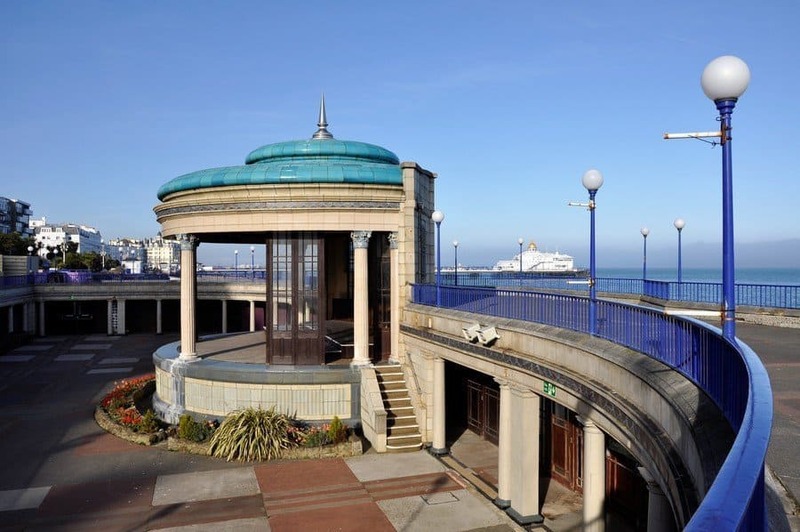 The first performance was held at the bandstand in 1935 and there are now over 140 concerts every year with firework displays and tribute bands. Just beyond the bandstand is Eastbourne Pier on of my favourite Eastbourne attractions. The pier celebrated 150 years in 2016 and all the domes were painted gold to mark the occasion by its new owner. Not without some controversy amongst townsfolk and the local council. However, the glitz remains and the Victorian Pier sparkles in the Sussex sunshine. You can enjoy afternoon tea on the pier or fish and chips but mind the seagulls don’t pinch them. 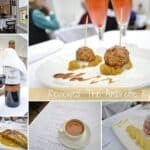 You can read more about Sussex Piers on Sussex Bloggers our website which shares the best of Sussex. The pier is the perfect spot to watch Airbourne the town’s annual airshow. The airshow is free and on for four days every August with lots of events taking place in the town as well as the airshow itself. The red arrows usually put on a display. 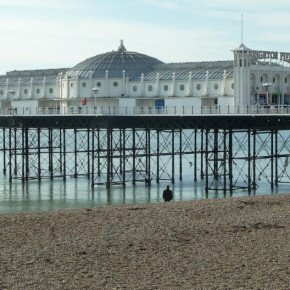 Keep strolling east for half a mile along the seafront, there’s lots to see, and maybe stop for coffee at the Pavilion Café. 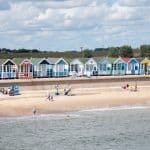 There’s currently a free National Trust exhibition there called Living on the Edge: 8000 years by the sea. The exhibition shows how life played out along the dramatic landscape of the Seven Sisters over the last 8000 years. Being Sussex born and bred I found this fascinating. The exhibition ends 12 November 2017. 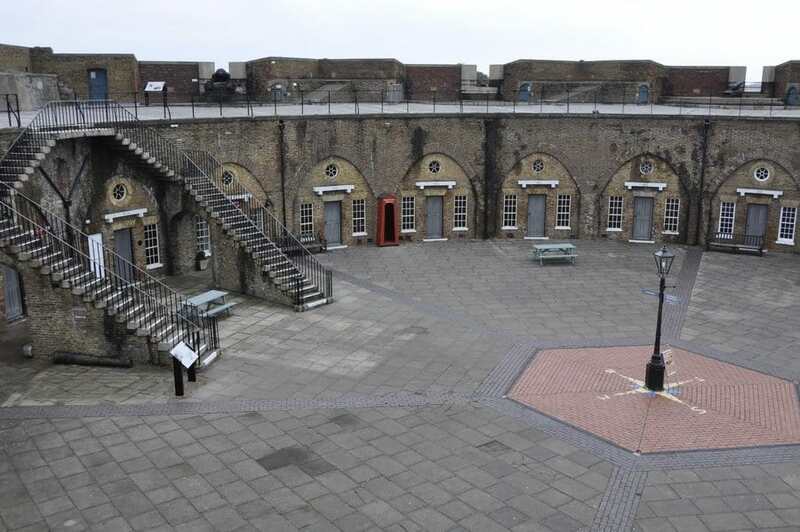 If you’ve got kids they’ll love Eastbourne Redoubt Fortress which opened to the public this year and is one of the newest yet oldest places to go in Eastbourne. It’s one of only three surviving Napoleonic fortresses in the UK and was built to defend the south coastline of England during the Napoleonic wars. The interactive exhibition details over 200 years of history and the daily lives of the soldiers that lived in the circular fortress from the Napoleonic times through to to World Wars I and II. I explored the casemates, the creepy cells and the gun platforms. Entry to the fortress is free but you’ll need to buy tickets to enter the casemates. The Beach Deck is very near to the fortress. With panoramic sea views the beach-side restaurant serves up excellent locally sourced food and freshly caught fish. I ordered catch of the day and was delighted when my dish arrived. The food was beautifully presented and looked almost too good to eat. Almost. Both my courses were excellent and I’ll definitely go back. If you’d like to know more Kathryn has written a full review of The Beach Deck. 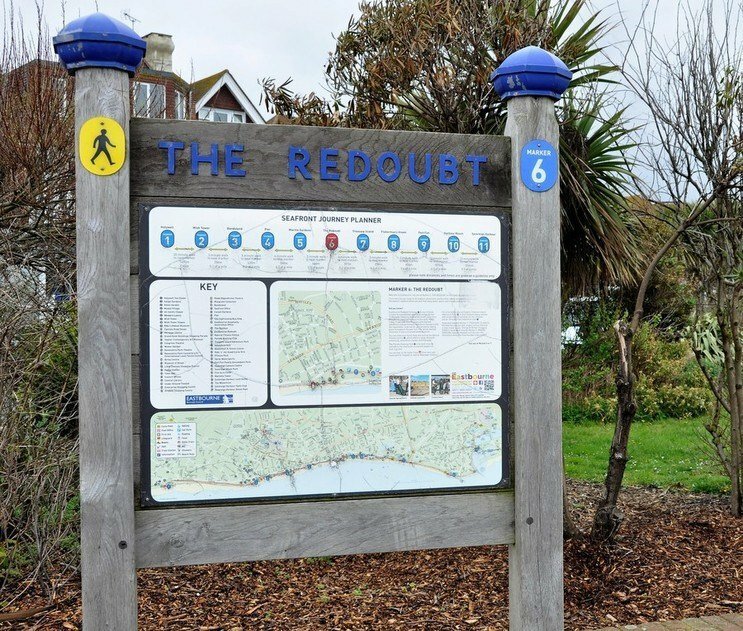 For information on travelling to Eastbourne and further details on visiting the attractions mentioned here check out the Visit Eastbourne website. After lunch we took a taxi to the Seven Sisters Country Park for kayaking with Buzz Active. 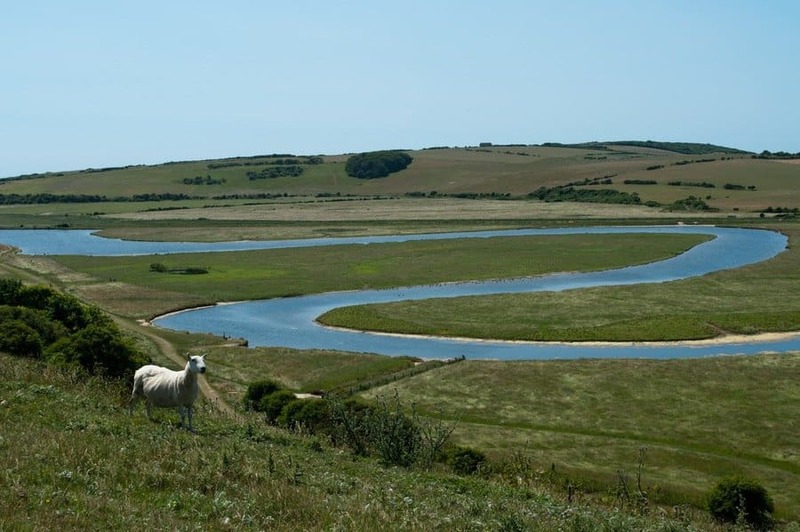 Cuckmere Haven is a flood plain where the river Cuckmere meets the English Channel. Nearby are the magnificent Seven Sisters cliffs. It’s a beautiful area with several oxbow lakes along the river. We spent a peaceful hour paddling with just the birds for company. 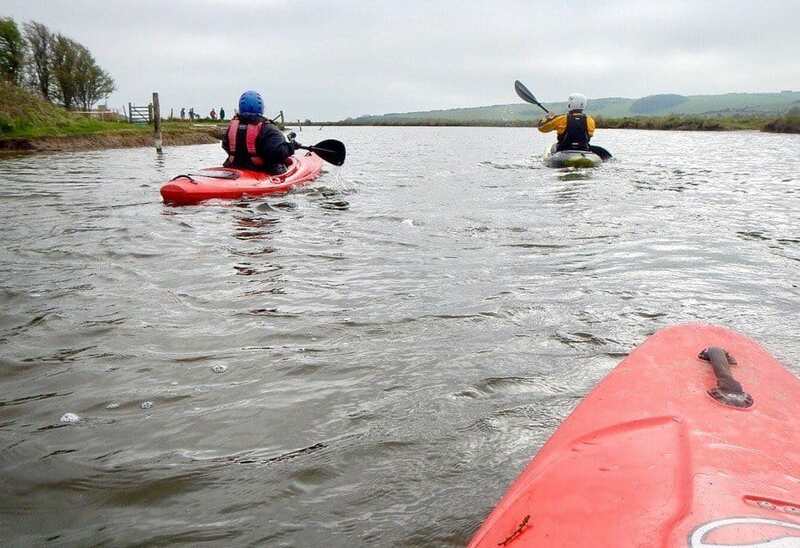 Buzz Active offer kayaking for individuals, groups, families and children from 6 years up. After kayaking we took a walk through Friston Forest and soaked up the views of the river as it meanders out to sea. To get the full impact of the oxbow lake turn right when you come out of the Seven Sisters car park and climb the hill towards the road. My favourite walk is down the west side of the river to Seaford Head to see the iconic coastguard cottages. There’s another parallel path which takes you to the beach where you can appreciate the full drama of the cliffs. I’d do all three walks because they’re all stunning. Walking time would be around 2-3 hours depending on your fitness levels to do all three. This is one of my favourite places in Eastbourne and East Sussex. 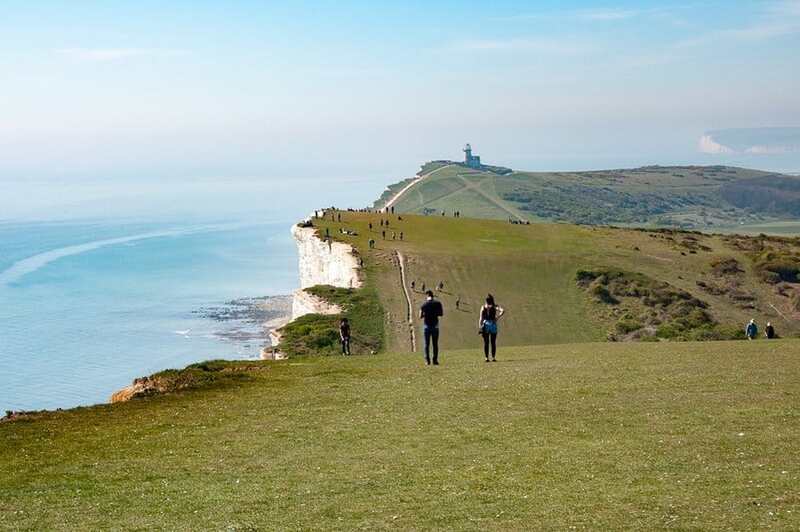 For a day’s hiking walk from Eastbourne to Seven Sisters Country Park taking in some of the South Downs Way. This is probably the most bracing of Eastbourne’s things to do. The walk along the cliff tops gives some stunning views across the English Channel and along the Sussex coastline. There are two lighthouses en-route. 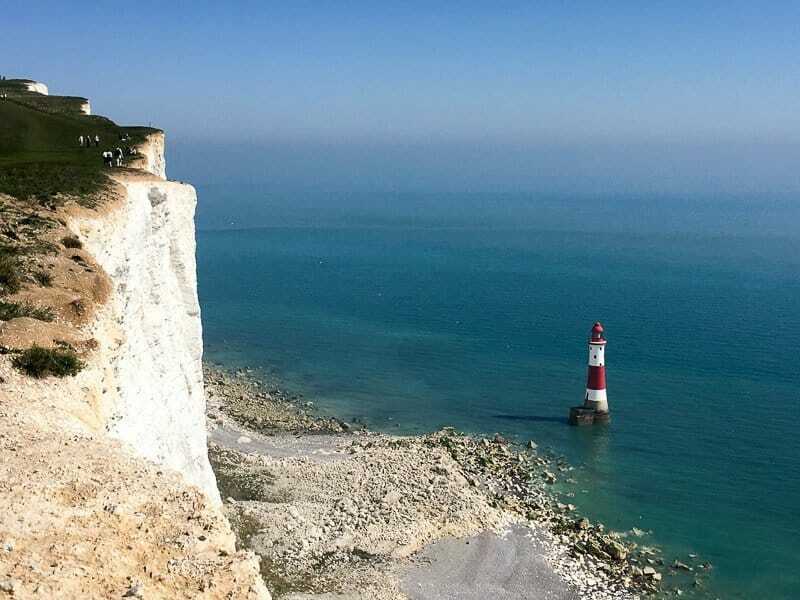 The red-striped Beachy Head lighthouse sits out to sea at the base of the chalk cliffs. Don’t walk too near to the cliff edge as the the white chalk regularly crumbles away into the sea below. Look further into the distance and you’ll see Belle Tout on the cliff top. In 1999 the lighthouse was moved, in one piece, 17m back from the cliff edge due to coastal erosion. It’s been designed to be moved again should it be necessary. If you like the idea of really quirky accommodation you can book a stay in Belle Tout Lighthouse. Check rates and availability. Carry on towards the west and you’ll eventually come to Birling Gap and then Seven Sisters Country Park beyond. 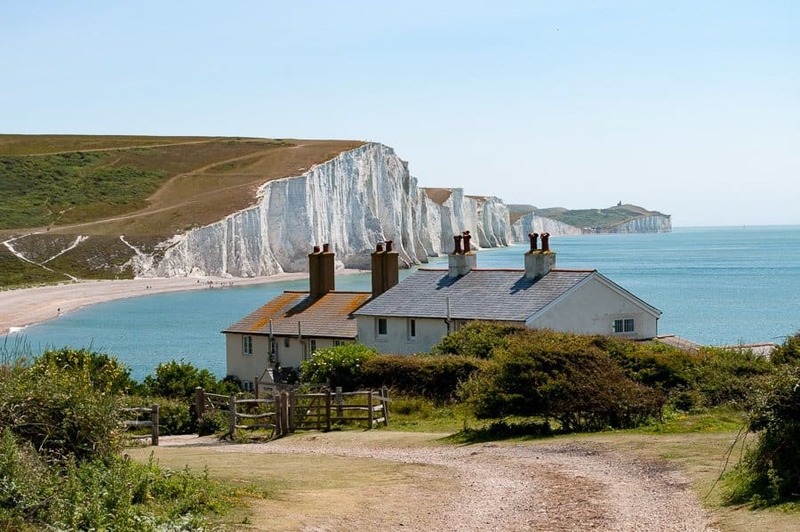 If you’re not up to a day’s hiking then Eastbourne buses have an open-topped sightseeing bus which stops at all these places except Seven Sisters. Adult: £10, Under 16s: £5.00, Students: £5, Seniors: £7.50, Family Ticket: £25 for a 24-hour pass. The bus leaves from the pier head every 30 minutes from 01 April. 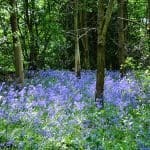 I used the Eastbourne Trails app to help guide me on my walks. There are three trails; The Blue Plaque Heritage Trail, the Seven Sisters Trail and East of the Pier Heritage Trail. Download the app (it’s free) for iPhone, iPod and iPod Touch and for androids. The handy app gave info on nearby attractions had a useful map and route feature with no roaming costs. Disclaimer: My visit to Eastbourne was complimentary, however, all opinions and thoughts are my own. Some of these images were taken after I went back to Eastbourne on a return visit. This post contains affiliate links. By using affiliate links, we earn a small commission when you book a room, tour or buy a product, etc. But don’t worry – you don’t pay any extra. I always forget how pretty the UK can be as its my home country I am normally looking at more exotic places. But I love your photos especially of the white cliffs it makes me want to get in the car and drive to the coast for a walk. 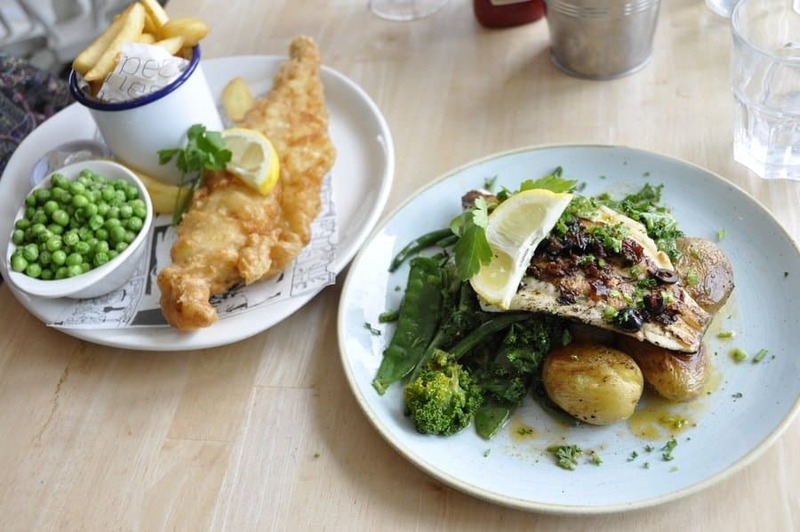 I also think we definitely have the best fish and chips in the UK your meal looks delicious. The food in the Beach Deck was so good – I agree re the fish and chips! I love exploring nearer to home as well as faraway places especially when the sun’s shining! This place seems so picturesque and spectacular, Suzanne! I would love to visit it! 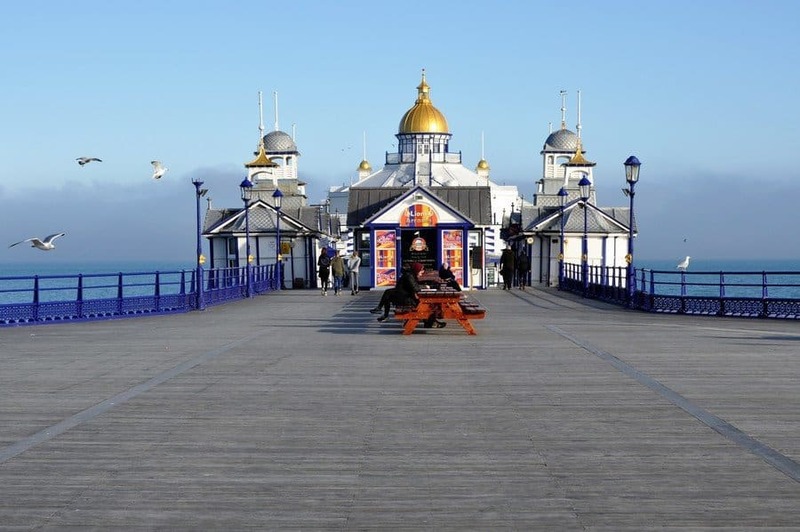 Absolutely stunning images, Suzanne … Eastbourne pier looks a lot better now then when I lived in Brighton. Seven Sisters is a beautiful spot to walk. Brings back a lot of great memories. I wish Sussex a lot .. from time to time. It was a pity that I was so busy working when I lived there .. that I hardly had a chance to enjoy the beautiful county. Let’s make Eastbourne a date next time I come to town. It will not be until next year now. We have a date then. I think I in May next year if I can wait that long. We may be going to a wedding in Australia around May but I need to check dates. I hope we can do both! You are indeed! We’ll make it work ? 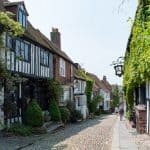 I walked my socks off in Eastbourne Jo – I hope you approve 😉 Even though it’s just down the road from me I had no idea how much there is to see and do there! The fortress great and the interactive exhibition inside was excellent. Such a lovely town and surrounds. This brought back happy memories. I still can’t believe how much I enjoyed the kayaking. I need to go back again to see the places I missed as well as revisiting a few favourites. I really want to go back and visit the Towner Gallery. The tennis is on there this week and next too – I’ve been in the past and it’s a great day out.